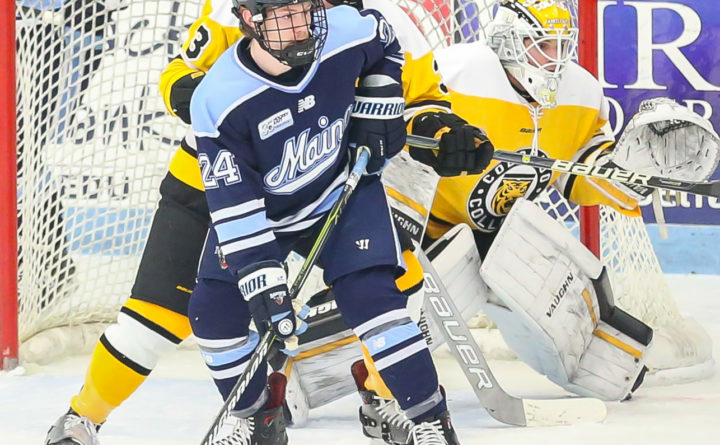 Adam Dawe (24) of the University of Maine camps in front of the net during a game against Colorado College earlier this season. Dawe scored his first collegiate goal on Friday night, but the Black Bears dropped a 3-2 decision to Northeastern at Alfond Arena. Patrick Shea of the University of Maine celebrates a goal during a recent game against Colorado College. Nationally ranked Northeastern University received first-period goals from Brandon Hawkins, Patrick Schule and Matt Filipe to build three-goal lead, and the Huskies survived a late University of Maine flurry Friday night to post a 3-2 Hockey East victory over the Black Bears on Military Appreciation Night at Alfond Arena. Northeastern improved to 13-4-1 overall, 7-2-1 in Hockey East, while the Black Bears fell to 7-10-2 and 3-4-2, respectively, losing at home for the fourth time in the past five games. The Huskies are 8-1 on the road this season. The teams will play again Saturday night at 7 at the Alfond Arena. Ryan Smith scored a second-period goal for UMaine, and Adam Dawe made things interesting with a power-play goal with 3:38 left in the game. But NU goalie Cayden Primeau made a great glove save off Brady Keeper’s snap shot through traffic with 15 seconds left to preserve the win as UMaine had pulled goalie Jeremy Swayman in favor of the extra attacker. “That was a huge save,” NU coach Jim Madigan said. The smaller Huskies dominated the game with their superior speed and skill and could have easily won by a larger margin if it wasn’t for the goalkeeping of Swayman, who finished with 39 saves compared to Primeau’s 19 stops. They kept the Black Bears pinned in their own end long periods, and UMaine had limited access to the NU zone. 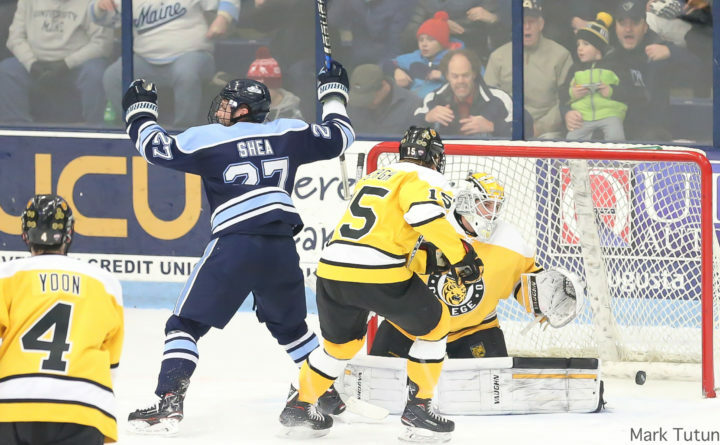 “We didn’t chip the puck deep until the third period, and they had an easy time breaking out against us,” UMaine senior defenseman and assistant captain Keith Muehlbauer said. Madigan called it a “complete game” performance by his team. NU senior defenseman and captain Eric Williams agreed with his coach. Hawkins opened the scoring 6:56 into the game off a beautiful setup by game-changing defenseman Jeremy Davies, who gathered in a bouncing puck in the left faceoff circle and darted neatly across the middle of the slot to the right faceoff circle. Davies then threaded the needle with a pass back across to the left faceoff circle and Hawkins one-timed it past Swayman into the open short-side corner. Schule extended the lead 3:12 later thanks to a rush by Tyler Madden, who motored around a stumbling UMaine defenseman down the left wing and sliced across the top of the crease. He got off a weak shot and Swayman got his pad on it, but the rebound spilled out to Swayman’s right and Jozefek roofed it from a tough angle along the extended goal line. Just 1:04 later, UMaine freshman right wing Jacob Schmidt-Svejstrup was assessed a five-minute major and game disqualification for head-butting, and Filipe capitalized. Liam Pecararo, who played at UMaine during the 2014-15 season, sent the puck to the open Filipe just outside the crease. Swayman smothered his first attempt but the puck came right back to Filipe’s stick, and he lifted a backhander past Swayman. The Black Bears killed off the final 3:18 of the penalty and a two-minute minor later in the period. Smith pulled one back with an unassisted goal as he blocked a shot and chased down the loose puck at center ice. He fought his way through a check and fired a wrister that broke off Primeau’s glove into the net. NU had several chances to expand the lead but couldn’t, and UMaine received its first power-play chance late in the third period and took advantage for its fourth power-play goal in its past nine chances. Rob Michel’s shot from the point was fumbled by Primeau and Dawe poked the rebound home for the freshman’s first college goal. “I took a swing at it and it went in off their defenseman,” Dawe said. Freshman Madden, who had two assists, and Primeau returned to the Huskies after playing for the United States’ silver medal-winning team in the recently concluded World Junior Championships in Canada. Madden is the son of former National Hockey League forward John Madden and Primeau is the son of Keith Primeau, another former NHL forward.